implement the Face Management of NFD Management Protocol. Definition at line 38 of file face-manager.hpp. Definition at line 43 of file face-manager.cpp. 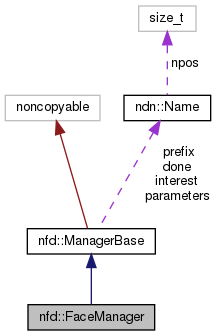 References nfd::FaceTable::afterAdd, nfd::FaceTable::beforeRemove, ndn::nfd::FACE_EVENT_CREATED, ndn::nfd::FACE_EVENT_DESTROYED, nfd::ManagerBase::registerNotificationStream(), and nfd::ManagerBase::registerStatusDatasetHandler().